Comment on how Shakespeare uses language to communicate the feelings of Romeo and Juliet in Act 2, Scene 2. ‘Romeo and Juliet’ is one of Shakespeare’s most famous plays. It begins with two well-known families who are sworn enemies. Romeo Montague and Juliet Capulet fall in love, which then ends in the tragedy of their deaths. Romeo’s opening soliloquy shows his true feelings towards Juliet. He begins by delivering a simple metaphor. He describes Juliet as “the sun!” This indicates that Juliet is bright, powerful and radiant. Romeo is enchanted by her beauty. Romeo uses allusions to astronomy by referring to the sun, moon and stars throughout the soliloquy. He continues to use these images as personification. “Arise fair sun, and kill the envious moon.” This is suggesting that Juliet’s beauty is powerful enough to destroy the moon – which is jealous of her. “Beyond this world” suggests Juliet’s beauty exceeds all that is on earth. Romeo also talks about his physical longing to be with Juliet. “O that I were a glove upon that hand, that I might touch that cheek.” This illustrates Romeo’s sexual desire, further by stating that he longs to touch Juliet, as a glove on her cheek would do. Romeo shows his true, inner feelings for Juliet by asking her to “Be not her maid…cast it off!” This is an imperative statement, as he wants her to liberate herself sexually. This symbolizes that Romeo does not just want to be with Juliet, but wants her to cast off her virginal clothes for him, instead of being Diana’s maid. Overall, the evidence implies that Romeo’s physical longing to be with and touch Juliet is very strong. Physical desire as well as strong emotional attachment is another dimension of Romeo’s feelings for Juliet. Juliet’s monologue begins with her asking, “Wherefore art thou Romeo?” Questioning the meaning of their names. “Deny thy father, and refuse thy name; or, if thou wilt not, be but sworn my love, and I’ll no longer be a Capulet.” This suggests that they must sacrifice family relationships to be together. She states that the names of their families represent a conflict, which divides both families, so she would rather give up her family just to be with her beloved Romeo. Juliet tries to justify her feelings and make sense of things by repeatedly asking questions. “What’s Montague? What’s in a name?” Juliet is painfully aware of the implications of a relationship between them, but does not fully understand why two well-known families should hate each other because of their names. Names represent conflict between the two families. Juliet feels she can only judge Romeo by who he is as an individual, not as part of a family. She continues with, “It is nor hand nor foot nor face nor any other part belonging to a man.” She is saying that body parts make up a person, not a name. “That which we call a rose by any other word would smell as sweet…” Juliet uses ‘rose’ as an example, as it is a romantic symbol, and she believes it would smell just as sweet if it were called something else. 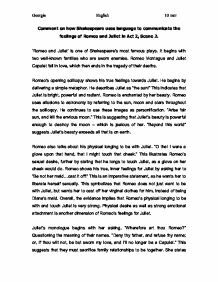 The evidence given is very different to Romeo’s soliloquy, however, Juliet’s physical longing to with Romeo is the same as his for her. Juliet is fully aware of the complications they will have. She is very pragmatic and cautious about her actions. In this dialogue, the two lovers confront each other about their situation. They realize the problems they would have if they started a relationship. Romeo begins by saying. “My name, dear saint is hateful to myself, because it is an enemy to thee.” This is a religious tribute, showing respect to Juliet as an exemplary human. Romeo knows his name is Juliet’s enemy, and therefore he believes it is also his own enemy, as he cannot be with Juliet as long as he has that name. Throughout the dialogue, Romeo shows his negative feelings towards what his name represents. When Juliet hears these words she appeals to the senses by replying with a simple paradox. “My ears have not yet drunk a hundred words of thy tongue’s utterance, yet I know the sound.” Juliet is intoxicated by Romeo’s voice. Juliet then completely ignores Romeo and warns him, “The orchard walls are high and hard to climb, And the place death, considering who thou art, if any of my kinsmen find thee here.” Juliet is telling him that if her family finds him here, they will kill him. Romeo continues to go on about his love for Juliet and even ignores her second warning. “Therefore thy kinsmen are no stop to m. If they do see thee, they will murder thee.” Romeo is not affected by this and replies. “Alack, there lies more peril in thine eyes; than twenty of their swords!” This indicates that rejection in Romeo’s eyes would be more deadly than being killed by twenty swords. Romeo also personifies his love for Juliet as a force, which gives super human powers; “Love’s light wings…For stony limits cannot hold love out.” He clearly states that the high, hard walls cannot hold their love out, so he does not care about them being there. The tone of Romeo and Juliet’s dialogue changes a lot throughout the scene. It begins with them discussing their feelings towards the names of each other’s enemy, and then ends with Juliet giving warnings to keep Romeo safe. As a reference to ‘Death and violence’, Shakespeare’s use of dramatic irony is significant. Romeo and Juliet move on to talk bout their love and their relationship. They decide they want to declare their love for each other faithfully. Romeo begins by using an elaborate image of travel. “As that vast shore wash’d with the farthest sea, I would adventure for such merchandise.” He would travel the world, just to convince Juliet of his commitment for her. By saying this, Romeo is showing that he is powerful and masculine, and that his strong feelings for her will not go away. Hearing this, Juliet then asks Romeo a direct question. “Dost thou love me?” She is looking for reassurance, so she interrogates Romeo. She knows what his answer will be, but she wants him to say it to he, so she can take his word for it. “I know thou wilt say ‘Ay’ and I will take thy word.” Here, Shakespeare is able to show Juliet is less experienced in love and so is quite cautious. She then repeats herself and says, “O gentle Romeo, if thou dost love, pronounce it faithfully.” By now, Juliet is feeling anxious and insecure, so she wants Romeo to do exactly that. With this, Romeo uses imagery to declare his love for her, by swearing on the moon. “Lady, by yonder blessed moon I vow that tips with silver all these fruit-tree-tops-“. Romeo tries to flatter Juliet by saying “Lady by yonder…” The “silver” on the “fruit-tree-tops” symbolizes the shine of the moon on the trees. He is swearing by this, because it sounds beautiful and is flattering. Juliet does not take too kindly to this and replies, “O swear not by the moon, th’inconstant moon, that monthly changes in her like a circled orb.” She takes the meaning literally and says that the moon changes all the time, but she wants their love to be constant. Changing of their love could be bad, so she does not want it to compare with the moon. Romeo tries to reassure Juliet, but she still seems worried. “It is too rash, too unadvis’d, too sudden; too like the lightening, which doth cease to be.” Juliet is comparing their love to the lightening – that it happened too quickly. She also uses repetition of the word ‘too’ to convey that everything has taken place ‘too’ quickly. Judging by Romeo’s determination to be with Juliet, his feelings are very strong and they will never go away. He says he cannot bear the thought of her rejecting him. Juliet more or less feels the same, however she is very cautious and pragmatic, she knows she must take care when it comes to her and Romeo. Romeo and Juliet continue discussing their feelings and he future of their relationship. Romeo is unhappy and needs some reassurance, so he asks Juliet, “O wilt thou leave me so unsatisfied?” and Juliet replies, “What satisfaction canst thou have tonight?” Romeo is showing his anxiety for Juliet’s love and wants her to tell him that she feels the same way. “Th’exchange of thy love’s faithful vow for mine.” He is again, trying to reassure Juliet that he loves her too much to let her go. Juliet then uses a simile to show her generosity. “My bounty is as boundless as the sea, my love as deep, the more I give to thee, The more I have, for both are infinite.” Juliet shows her willingness to give all her love to Romeo and that her love is ‘endless’ and will keep going on forever. Juliet then hears the nurse calling within, so she tells Romeo; “Sweet Montague, be true, stay but a little, I will come again.” She is reassuring Romeo that she will be back, as they both know that she does not want to leave him at that point. When Juliet leaves for the first time, Romeo becomes afraid that it might all just be a dream, “O blessed, blessed night! I am afeared, being in a night, all this is but a dream, too flattering-sweet to be substantial.” Romeo is shocked, and assumes it is too satisfying and charming to be real. Juliet then enters and says goodnight again to Romeo. She tells him to send her word tomorrow. “Where and what time thou wilt perform the rite; And all my fortunes at thy foot I’ll lay, and follow thee my lord throughout the world.” Juliet says that she will marry him and would go anywhere with him, just to show her commitment. Juliet exits and Romeo goes on to declare his undying love for her. He uses a simile to compare their love; “love goes towards love, as school boys from their books, but love from love, toward school with heavy looks.” It shows the youth and innocence of children, as Romeo and Juliet are desperate to be together. This simile means that in the same way, schoolboys are desperate to leave school; Romeo and Juliet are also desperate to be together. When apart, they share the misery of schoolboys having to go to school. Romeo and Juliet appeal to sound and taste, when chatting softly about love. Romeo uses a sensuous simile to express his feelings; “how silver-sweet sound lovers’ tongues by night, like softest music to attending ears!” ‘Sweet’ is referring to the delicious taste, and ‘silver’ would be described as, precious and expensive. Juliet decides she wants possession of Romeo and does not want to let him go, she says, “I would have thee gone; and yet no farther that a wanton’s bird…” Juliet describes her feelings towards Romeo as; “loving-jealous.” This is a paradox, which shows her intense desire and the conflict of her feelings. Even though she loves him so much, she is jealous of him going away and not coming back. But, so he does not do that, Juliet wants to make sure she has complete control to keep him close to her. She continues with her strong feelings. “Yet I should kill thee with much cherishing.” This dramatic irony is showing the strength of their love, which sadly results in their death. This is ironic, as it becomes true. After repeatedly saying ‘Good night’ to Romeo, Juliet believes parting to be such “sweet sorrow.” This is an oxymoron, showing conflict issues between the two families, yet it is appealing. Overall, the feelings that the two lovers share are quite similar, however, Juliet uses jealousy and conflict as paradoxes, but, linked up with love and hope. In conclusion to the powerful feelings shared between Romeo and Juliet, the language used shows a great effect upon their hopeful relationship and future together. Shakespeare incorporates a range of literary and linguistic features such as, simple metaphors and similes and paradoxes and oxymoron’s used by Juliet, especially towards the end of the scene. Juliet’s speeches involved sources of conflict and “sweet sorrow”, also towards to the end of the scene. Shakespeare uses this scene to establish their characters as the ways in which they respond to their love for each other, reveals their personalities. Images of violence relate to the conflict Romeo and Juliet both feel because of their families. They do not understand why two families should quarrel because of their enemy’s name or existence. There is also dramatic irony, as they both die because of their love. Shakespeare portrays religious references, which imply that their love is wholesome and they are committed to each other. Astronomical and natural imagery is used to signify their love is outside the everyday human experience of love. By describing Juliet as “the sun”, Romeo is indicating that she is powerful and bright. Romeo also refers to the moon by suggesting that Juliet should “Arise” and “kill the envious moon”. This is a use of personification. In the first scene Act1 scene1 of Zefirelli's takes place in a court yard which has cobbled flooring and large brick walls surrounding it giving the feeling to an audience that it is a small town perhaps even village like image and that this would have been an average day for the people of Verona. Juliet more or less feels the same, however she is very cautious and pragmatic, she knows she must take care when it comes to her and Romeo. Romeo and Juliet continue discussing their feelings and he future of their relationship. This states how summer is short - it begins and ends. The woman's beauty is ongoing, it does not begin, nor end, it is eternal. The sun is now personified, to make it easier for the audience to compare it to the woman; it is described as the "eye of heaven", with "often is his gold complexion dim'd." this time this was a very offensive word to be called. While tension increases romeo and Juliet meet and fall in love the share kisses and proclaim there feelings for each other and how ever they do not realise that they are sworn enemies. Before act 3 scene 5, Juliet and her father have a moderately secured relationship. Capulet refers to her as 'the hopeful lady of my earth', which shows he very much considers her and she is imperative to him. Capulet showed more love and interest for Juliet than her mother lady Capulet. Juliet realizes that it was a mistake to fall in love with Romeo, because he is one of the people she should watch out for. He is her first and only love, but he is an enemy of her family.